Dairy processing plants are where Anderson-Negele learned about hygienic processes and the need for robust sensors and control instruments. It is for this harsh, wet environment that Anderson-Negele designed its instrumentation to avoid moisture ingression and function through thousands of process and cleaning cycles. It’s also where we learned that designing the right instrumentation is only part of what our customers need. Having sanitary process expertise at the application level means Anderson-Negele can prescribe the right instrumentation for your process. 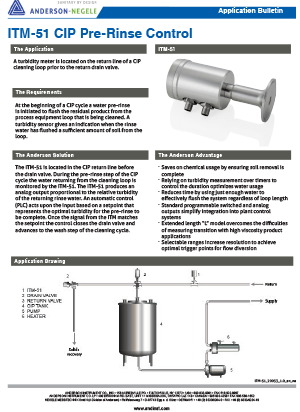 Our application expertise supports a broad product line that meets FDA regulatory applications including all required pasteurization controls (PMO) as well as operational control of variables such as level on balance tanks, conductivity for CIP solution, and the increasingly popular turbidity measurement for phase transition. 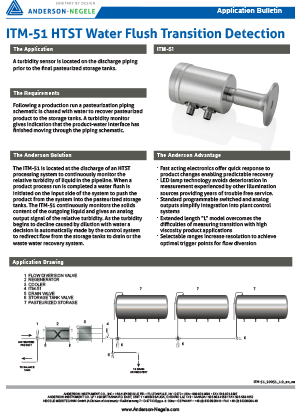 Anderson-Negele has the largest, dairy process-focused, instrumentation suite on the market. Our instrumentation is designed to 3-A sanitary standards to ensure the best possible cleanability.